Quit Victoria recommends mental health services use a whole of organisation change approach. The Tackling Tobacco framework was developed by Cancer Council NSW and aims to reduce the physical, social and financial impact that smoking has on in disadvantaged populations, often bringing them further into personal hardship. Organisations that service disadvantage populations are perfectly placed to create positive change as they have existing connections with these populations, are committed to improving their wellbeing and are familiar in promoting positive behaviour change. 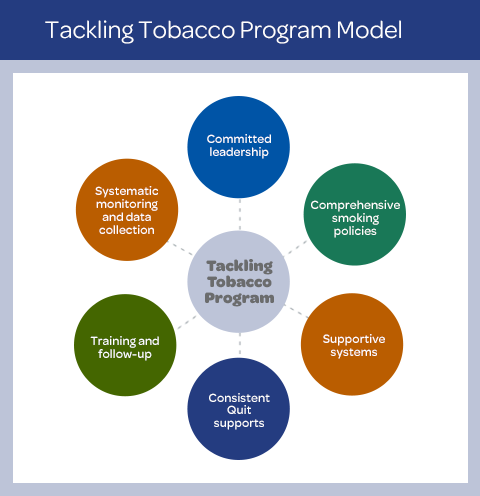 The Tackling Tobacco program is made up of six key elements, also referred to as areas of change. The six elements work together as an organisation-wide approach to address smoking by promoting shared responsibility, creating a smokefree culture and ensuring smoking care becomes part of the usual support provided by your service. Committed leadership: Involves identifying project leaders who will drive the change and establishing commitment from senior staff. Comprehensive smoking policies: Acts as the foundation to your Tackling Tobacco plan. Involves addressing smoking by developing clear policies to guide and support action. Building supportive systems: Linking policies to action by changing systems and protocols to address smoking. Consistent Quit supports: Actively providing routine smoking care to clients and linking them to additional support. Training and follow up: Training, upskilling and increasing staff confidence to address smoking as a part of every day client support. Monitoring and data collection: Evaluating how well your organisation is addressing smoking and providing ongoing support to clients.